While ecommerce growth looks rosy, small online retailers know that making a sale is not always easy. Even if you can get consumers interested enough to visit your website, you have to prevent shopping cart abandonment in order to grow your business. In this article, we explore the reasons why shoppers abandon their carts plus give you other interesting shopping cart abandonment statistics. 1. How much product is going to be abandoned in online shopping carts in 2017? 2. Why do online shoppers abandon their carts? 3. What is the best way to prevent abandoned online carts? Free shipping is one of the best methods to encourage shoppers to complete their purchase. 93 percent of consumers reported that they would be motivated to buy more products if the retailer offered free shipping in some form. 4. Should online retailers consider making registration optional? Yes, they should because a guest checkout option encourages consumers to complete the transaction. There’s one less step that consumers have to complete before making their purchase. A website and product usability firm saw that sales rose by 45 percent after removing mandatory registration on their site. 5. What are the shopping cart abandonment rates in different sectors? More than 60 % of consumers abandoned their carts across categories! 6. How important is it to make sure that your website loads fast to avoid shopping cart abandonment? Very important. For each passing second that your website takes to load, cart abandonment climbs by 7 percent. 7. What are the checkout completion rates for various devices? Checkout completion rates are low across all devices. Desktops and tablets are tied at 13 percent while mobile phone completion rate stands at 8.5 percent. 8. What is the average number of checkout form elements in the US? Checkout form elements are fields that shoppers have to fill out with their personal details, such as billing address, shipping address, and telephone number. On average, checkout flows in the US have 23.48 elements. 9. What is the ideal number of checkout form elements to improve checkout completion rates? 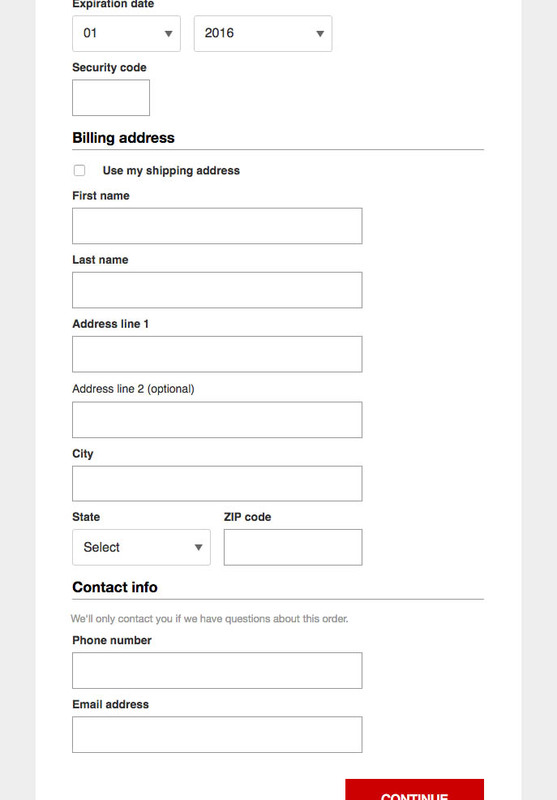 A study revealed that the ideal number of checkout form elements is 12. 10. Should online retailers make it a point to display trust badges such as the Norton Secured or VeriSign logo? Yes. Around 6 out of 10 online shoppers abandoned their purchase because trust badges were not available. 11. 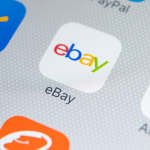 What are the most recognizable online trust badges? 42 percent of online shoppers are familiar with the Visa-Mastercard logo, followed by Norton Secured at 15 percent, and Google Trusted Store at 6 percent. 12. When are carts abandoned the most during the day? Most carts are left behind by online consumers between 8 – 9 pm in the evening. 13. 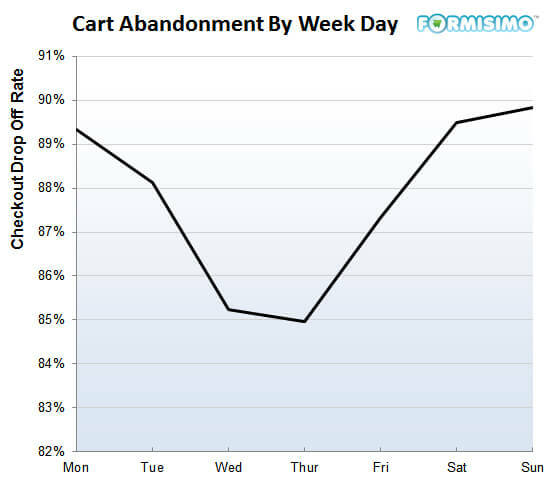 What days of the week have the highest cart abandonment rates? Saturday and Sunday have the highest cart drop off rates. Nearly 9 out 10 carts are abandoned during those days. 14. How long should an online retailer wait before sending abandoned cart emails? Retailers should not wait longer than three hours if they want to enjoy relatively high open rates and click-through rates. Those who send abandoned cart emails within this time period get an average of a 40 percent open rate and a 20 percent click-through rate. 15. Are retargeting ads effective in converting online shoppers who abandoned their carts? Yes, retargeting ads are very effective. 7 out of 10 online consumers are more likely to convert if they are retargeted after leaving their cart behind on other websites that they visit. Online retailers are losing money because a significant number of shoppers leave without completing their transaction. 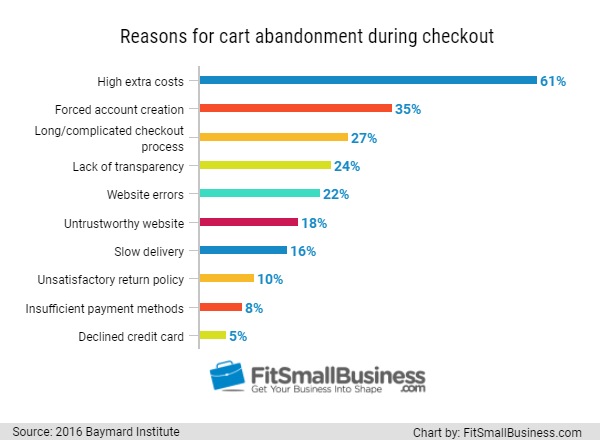 Consider these statistics when coming up with a plan to combat shopping cart abandonment. Do you have other insightful shopping cart abandonment statistics? Feel free to share them in the comments section. Actually, for most of the shopping carts are abandoned online since the people have the desire to buy, but empty pocket, then have you ever think why the real plastic shopping trolley in mall or supermarket abandoned? I like this article that analyzed the instantly situation facing mall and supermarkets. such as list.14, this is a bond if buyer will pay the order or place the order.